Gather close and I will tell you an unipkaaq, a story that has been passed to me from generations past. I learned this tale from Nasruk many years ago. He told me that that there is great wisdom in the listening for those who are willing to hear. Remember, when you are part of the Iñupiat people, you are never alone (Never Alone). This is the story of Kunuuksaayuka. The story of an endless blizzard that threatens the survival of our people. A story of a dangerous and cold journey at the top of the world. A story of bravery and true friendship. Come play my story. You are Girl and Fox, crossing dangerous lands, facing icy peril. Meet fantastic creatures and visit lost villages. Discover the mysteries and beauty of the helping spirits that are hidden in the world around us. Work together to overcome the challenges and obstacles that Nature, in her fury, will throw against you. Alone you cannot survive. But together you just might - if you can use each other’s strengths wisely and you refuse to surrender to the wind and snow and dangers that stalk the frozen North. Succeed and you will restore balance to the land. Fail and all will be lost. Never Alone is an atmospheric puzzle platform game for 1- or 2-players built in partnership with the Alaska Native community. It delves deeply into the traditional lore of the Iñupiat people of the Arctic to present a game experience like no other. Never Alone is based on traditional Iñupiaq stories. The Iñupiat people, who live primarily in the farthest north regions of Alaska, have an amazing storytelling tradition with tales that are complex and filled with both fascinating characters and exciting adventures. The stories reinforce the culture’s strong values, traditions and worldview and have been the main vehicle for passing wisdom and knowledge from one generation to the next. To bring these stories to life, the development team partnered with nearly 50 elders, storytellers, artists and more from the Alaska Native community. 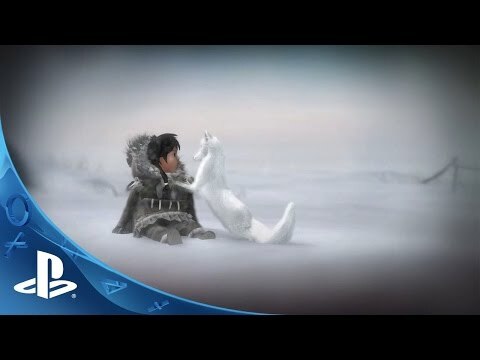 This partnership ensures that Never Alone faithfully captures the unique perspective of the Iñupiat people and celebrates and shares their stories with the world through game play. Take on the roles of both Nuna and Fox as you explore the fascinating, frigid, and potentially fatal, world of the Iñupiat people. Each character has unique skills and abilities and they must work cooperatively, each relying on the other’s talents. Nuna can push and pull objects, climb ropes and throw her bola. Fox can leap to areas inaccessible to Nuna, scramble up walls and reveal the mysterious helping spirits. Nuna and Fox must succeed together as neither can survive without the other. In one-player mode, the player can switch seamlessly between the two characters with a single button press. A second player can join in at any time by activating the second controller, taking over the AI-controlled character and jumping immediately into the action.